Fevers in babies over six months of age are handled a little differently than fevers in younger babies. By six months, your baby’s immune system is much more developed, making it easier to fight off common illnesses. Fever, which is defined as a body temperature of 100.4 degrees Fahrenheit or higher, is no longer a medical urgency in babies this age, as long as the infant is behaving more or less normally. In addition, by six months, babies should have received three full sets of vaccines. That gives them some protection against deadly diseases, including whooping cough, meningitis, and sepsis (blood infection). The goal of treating a fever in your older baby is to make your baby more comfortable and relieve symptoms. You can treat the fever with either acetaminophen or ibuprofen. The right dose depends on your baby’s weight, so it is important to ask your doctor at the six-month well-child visit how much medication is appropriate. As always, medication should be measured with the syringe that came with the medication to ensure the correct dose and delivery method. For babies who cannot take oral medication for whatever reason (e.g., vomiting or they just refuse), you can use an acetaminophen suppository. 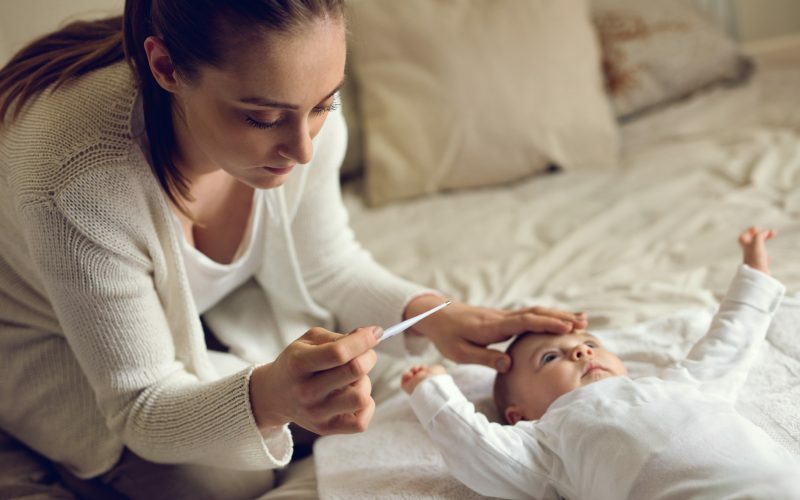 If a fever begins suddenly, it’s appropriate to give your baby a fever reducer and then call the doctor’s office to see what action to take next. It may take up to sixty minutes to see the full effect of the fever reducer. Doctors do not need to actually see the fever, so there’s no need to wait until you get to the office to treat it. If the fever reducer brings down the temperature and your baby is behaving like normal, then a trip to the emergency room is not necessary. It is important to remember that treating a fever does not cure whatever virus or bacterial caused it in the first place. A doctor may still want to see your baby to determine if an antibiotic or other treatment is necessary. Fever is a temperature of 100.4 degrees Fahrenheit or greater. Infants older than six months should have received three full sets of immunizations, lowering their risk of serious infection. In fully vaccinated infants, fever does not require a trip to the ER unless the baby is acting abnormally. Calling your doctor’s office is appropriate if you are not sure what to do. After six months of age, ibuprofen and acetaminophen are appropriate medications for lowering a fever. Use the measuring device contained in the medication package and dose according to the infant’s weight. Never use a household spoon to measure medication. For babies who can’t take oral medication, acetaminophen suppositories are a great alternative. It often takes 60 minutes to see the full effect of a fever reducing medication. A visit to the doctor can help determine if the infant requires antibiotics or another medication to treat the cause of the fever. Check with the doctor at the six-month visit to determine the correct dose of medication. Fevers in babies older than six months are not considered medical emergencies in most cases. It’s fine to treat the fever before visiting your doctor. Acetaminophen and ibuprofen are both acceptable. You can check with your doctor to get the correct dose. American Academy of Pediatrics. Fever. S. National Library or Medicine. When your baby or infant has a fever. Self harming behaviors are not uncommon in this age group particularly in children who become frustrated easily. It is important that you make an appointment with your pediatrician to discuss this behavior so that you can help him overcome this phase. It could be due to a language delay causing frustration or due to a developmental issues, but without much more information I cannot say for sure. In the meantime, make sure you are giving him lots of eye contact, patient correction and are gentle with him when he does this behavior. He is likely trying to tell us something!